What is the cost of developing an online course based on each approach? What is the cost of delivering the course, per learner or per hour? What is the learning efficacy (outcome) that can be expected? Development costs for modules are comparatively expensive, as they are media-intensive and require complex production and technical skills. Often this leads to under-spending on the instructional design. The main attraction of this approach is its low delivery cost. It scales really well. 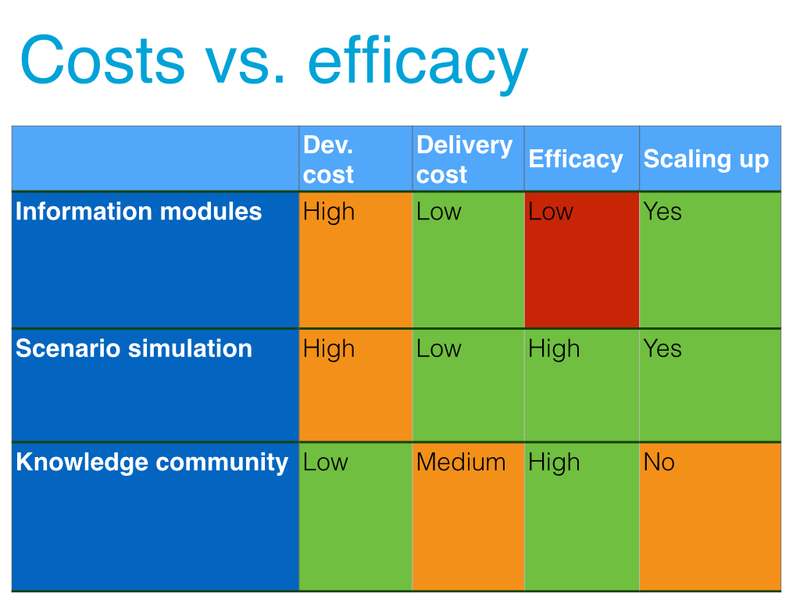 Once you have a self-guided module online, the delivery cost is marginal. All of a sudden, you can abandon the elaborate schemes in place mostly to restrict access to limited numbers of seats. Unfortunately, the death knell for this approach is its limited efficacy. It doesn’t work very well and, probably, only marginally better than giving a motivated learner the raw content to prepare. Developing an online, scenario-based simulation does not necessarily require intensive media production. We are not talking about building a humanitarian ‘Second Life’. Combine compelling, well-written prose with a few images. What matters is the complexity of the scenario’s decision points, the diversity of its cast of characters, and the design of a scorecard that provides rich formative feedback. Add a time element to put the pressure on. The development costs can be high, but the investment is in the design of a powerful experience for the learner, not in the bells and whistles. Best of all, such simulations can be self-guided (while modeling collaboration and team work by interaction with the fictional cast of characters) and therefore have the same marginal delivery cost as the ineffective information modules do. And, of course, there is a powerful case (and accumulated evidence) that allowing people to make choices and experience their consequences (as success, failure or somewhere in between) generates a virtuous cycle of engagement, retrieval, and retention. The knowledge community concept starts with an online course in which peer-to-peer relationships are the basis for the co-construction of knowledge. A learning environment like Scholar, grounded in Bill Cope’s and Mary Kalantzis’s New Learning, can fully align the way we learn to the way we work and collaborate. Because learners are the ones producing knowledge, the roles of teachers and experts are transformed. A seemingly absurd parallel can be made between this approach and reality television. When learners are teachers and teachers are learners, the development costs are low. The fact that peer review and other forms of learner dialogue require a synchronous cohort implies more-than-marginal delivery costs, but does not prevent scale. A large cohort can be split into smaller communities, reinforcing bonds of knowledge and collaboration. Together, I believe that scenario-based simulations and knowledge communities can sustain an agenda for new forms of humanitarian learning and assessment. And, yes, lower costs along the way.